When you put your baby down for the night, you want to make sure she is able to sleep safely and soundly. Knowing the latest safety standards and regulations from the U.S. Consumer Product Safety Commission will help you avoid cribs and other products that put your baby at risk while she is sleeping. Every crib a baby sleeps in, whether in your home or a daycare center or sold new or used should comply with the standards. Failing to follow the latest safety standards can put your baby at risk. 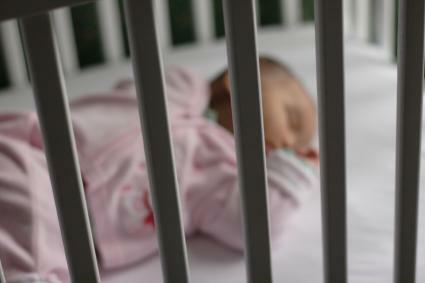 Drop-side cribs were one of the biggest reasons the U.S. CPSC introduced tougher crib safety standards. From 2000-2011, 32 infants died from drop-side crib accidents and millions of drop-side cribs were recalled. Many drop-side cribs featured misinstalled or malfunctioning hardware that could cause a baby to become trapped between the rail and the mattress, and suffocate as a result. Because of the recalls and accidents, drop-side cribs are now banned in the United States. Both new and used drop-side cribs are prohibited from being sold. Parents still using a drop-side crib are encouraged to replace it immediately with a newer crib that meets federal safety standards. This includes cribs that were previously fixed with kits offered through recalls from major manufacturers. Along with drop-side crib recalls, thousands of cribs were recalled for weak mattress supports. The new safety standards require cribs to undergo testing to ensure the stability of their mattress supports. No matter how safe the mattress supports are, the wrong mattress can also put your baby's life at risk. The U.S. CPSC also offers standards on crib mattresses. These include choosing a firm, tight-fitting mattress, making sure there are no gaps between the sides of the crib and the mattress, and only using a fitted sheet designed to fit a crib mattress. Having a mattress that is too soft or adding too much extra fabric to a crib through loose-fitting sheets, blankets or pillows can cause SIDS or be a suffocation risk. A latch and lock feature to stabilize the play yard and keep it from folding in on a child. Top rails that do not fold down into a V or diamond shape, which could strangle a child. Sides your infant or toddler cannot climb out or flip himself over. A bassinet or changing table that attaches to the play yard and does not have slits, straps or holes a child could become trapped in. As a parent, you decide if you want your baby to sleep in a crib or if you want to adopt another sleeping arrangement, such as co-sleeping. You also make decisions about what accessories to include in your baby's crib. However, the U.S. CPSC includes voluntary standards along with its mandatory standards. These voluntary standards are suggestions related to what the federal government thinks is in the best interest of your child, but have not determined to be a big enough risk to make mandatory. One of the voluntary standards encourages parents to avoid allowing babies to sleep in adult beds. The standards note that infants are at risk from falling off adult beds, suffocating on fluffy mattresses or loose bedding, or getting caught between mattresses and headboards, footboards or the wall. Placing pillows around the edge of the bed may break an infant's fall, but could cause the infant to suffocate. Use of soft crib mattresses, blankets, pillows or stuffed animals in a crib is highly discouraged. These items pose a suffocation risk. If you need to keep your baby warm, the U.S. CSPC suggests using a sleeper, sleep sack or other special sleep clothing instead of a blanket. According to information published at NPR.org, some pediatricians have also called for a ban of crib bumpers because they pose a suffocation risk. Once you know the regulations, it's time to choose a crib for your baby. Since all cribs sold in the United States are required to meet the new safety standards, you can rest assured that every crib will keep your infant safe, but a few models are better than others. IKEA's Gulliver Crib is inexpensive and one of Consumer Search's top-rated cribs. It also converts into a toddler bed. Stork Craft's 4 in 1 Fixed Side Convertible Crib converts into three different beds to grow with your child. You may have a particular vision for your baby's nursery or dream of using the same crib generations of family members have slept in, but your baby's safety comes first. Buying a new crib from a reputable retailer in the United States is the best way to guarantee it meets the latest safety standards. Once you have the crib, skip the fancy bedding and remember the U.S. CPSC's slogan of "bare is best" to make sure your baby sleeps as safely and soundly as possible.